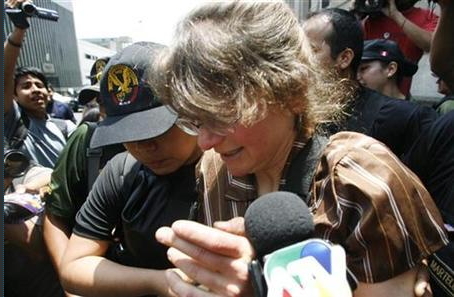 LIMA (Reuters) - Lori Berenson, a U.S. citizen serving a 20-year sentence in Peru for aiding leftist guerrillas, has given birth to a baby boy, her father and a hospital said on Wednesday. The boy, named Salvador Anespori Apari Berenson, was delivered by Caesarian-section. The 38-week pregnancy was complicated by back problems that Lori has and she will need to have surgery in the future, her father, Mark Berenson, said by telephone from New York. The baby's father, Anibal Apari Sanchez, 45, a former member of the radical Tupac Amaru Revolutionary Movement, or MRTA, is now a lawyer in Lima. Berenson and Apari married in 2003. Berenson has been in jail for more than 13 years, many of them high in the Andes mountains. After years in remote prisons, she was transferred in January to Peru's capital, Lima, to get health care. She was arrested in 1995 on charges of being a leader of the MRTA, a leftist insurgency that was active in Peru in the 1980s and 1990s. A military judge jailed her for life, but under pressure from the United States, a civilian court retried her and sentenced her to 20 years. She could be paroled next year. "I have to hope that Peru will look leniently on Lori. She's been in prison in Peru for a very long time with a sentence far disproportionate to anything she could have ever been involved with," her father told Reuters. In Peru, inmates are allowed conjugal visits and women who give birth in prison can keep their children with them for the first few years.